The fireworks we enjoy on bonfire night are a historical representation of the gunpowder used by Guy Fawkes in his 1605 plot to blow up parliament. The shows you will see around the 5th November have been refined over the years, to create breathtakingly colourful displays that entertain, rather than destroy. Fireworks are all about science but what goes into these chemical reactions to create such amazing colours and sounds? The Chinese first created fireworks over 1000 years ago, stuffing bamboo with gunpowder and lighting it with a flame. This design, although rudimentary, is still the basis of how fireworks are made today. A shell, a fuse and an explosive. A modern firework is comprised of roughly 3 different areas. The fuse is where the firework is ignited, this can be done with a flame but in large public displays, it is often done using electrical current. The fuse then burns until it comes into contact with the gunpowder, which is known as the motor. This crude explosion is what sends the firework skywards. The bulk of a firework is filled with chemicals that are used for the effects, which are the colours and sounds displayed in the sky. Again, they are essentially explosives but different metal salts are used to create various colours. 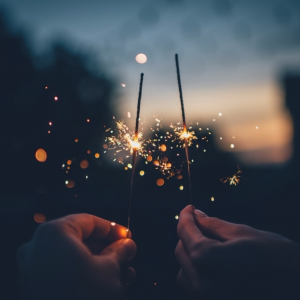 For example, sodium chloride, table salt, burns yellow (Don’t try this at the dinner table) and iron or steel grains create the bright light that you see on sparklers. A single firework can contain multiple colours and effects that are timed to create the optimum show. The last thing to consider about a firework is making sure it flies safely in the right direction. You may notice that they are shaped like rockets, this not only looks good but has practical reasons. The head or ‘payload’ will usually be pointed in the shape of a cone. Doing this makes the device fly faster and straighter. The tail will have aerodynamic properties with a wooden or plastic stick. This tail also helps the firework fly straight and combined with the coned head allows the explosion to take place safely high in the sky.